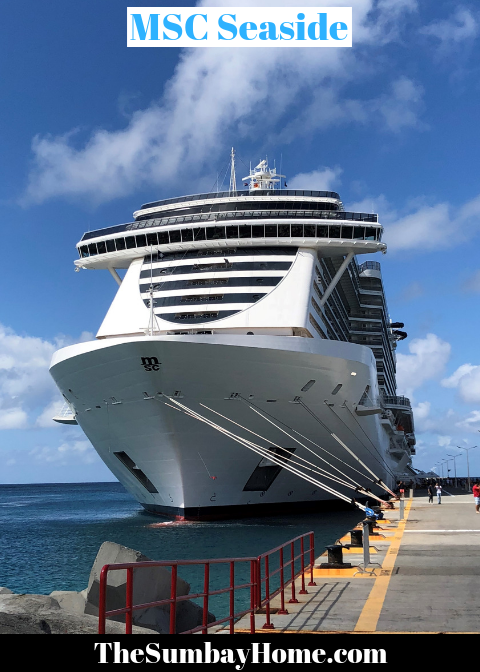 Well, we just returned from spending a week onboard the MSC Seaside. 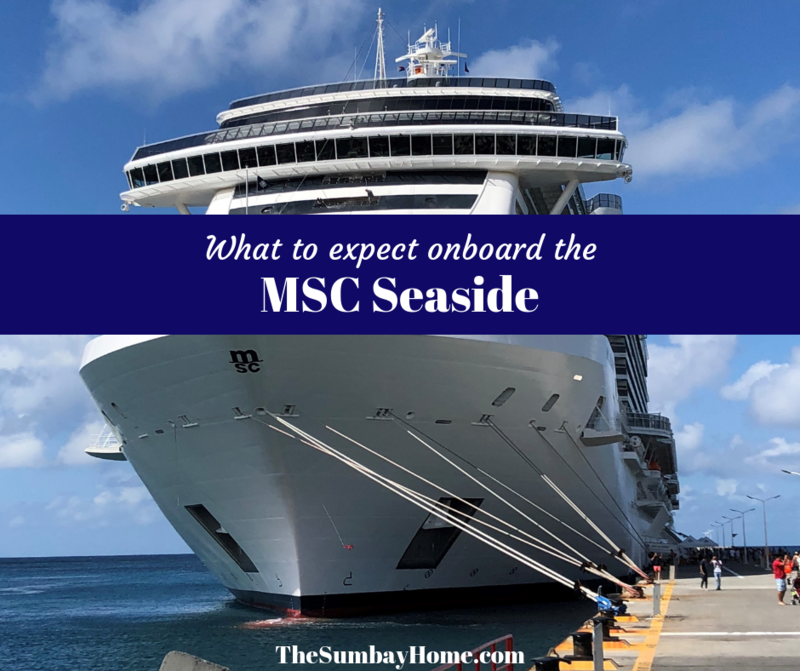 Here are our thoughts and what you can expect if you choose to sail on an MSC cruise in the near future. 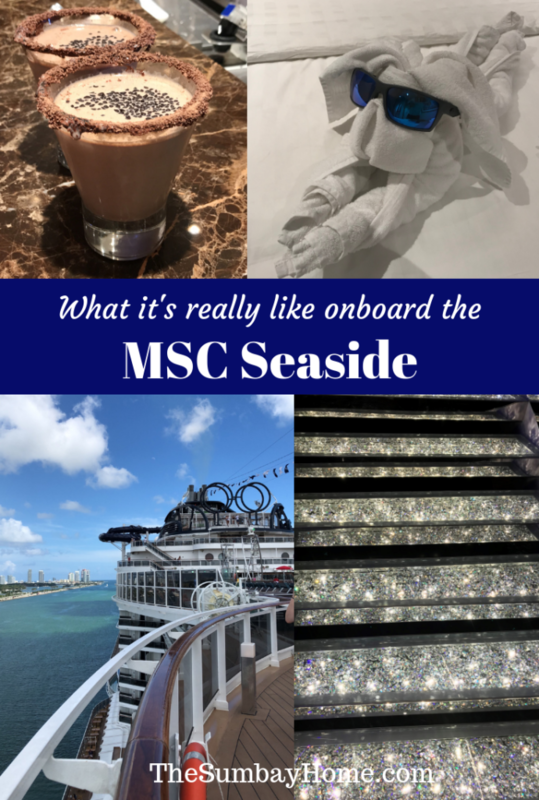 MSC is a fairly new cruise line to us and the Caribbean, so we didn’t know what to expect. We had some concerns since we did not know much about them. We didn’t want to spend a week on a ship and have a horrible time. 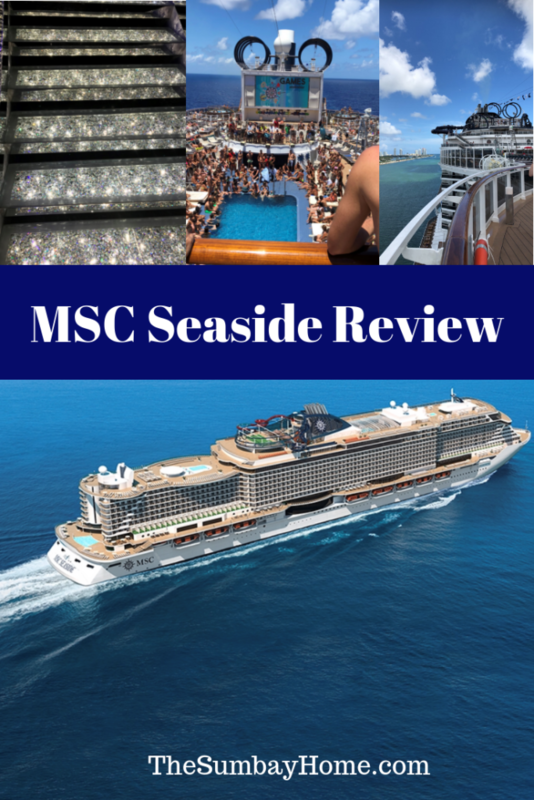 However, due to the price of the cruise compared to some of the other lines, we decided to give MSC a shot. *This page contains affiliate links to products I recommend. If you purchase something from this page, I may receive a small percentage of the sale at no extra cost to you. Since we live in Florida, we typically cruise every chance we get. Sometimes once or twice a year, and others 3 or 4 times a year. It is the most convenient and worry-free way for us to vacation. Since we live in the middle of the state, we can drive to any Florida port in less than a few hours. So when we cruise, we don’t have to worry about flights and hotels, just usually the cost of the cruise. This is how we are able to cruise so often. Also, we are flexible and typically book our cruises 3 to 6 months out. Which helps us get the best deals out available. Let me start by saying this ship is brand new, and it is extremely nice. The pictures didn’t do it any justice. 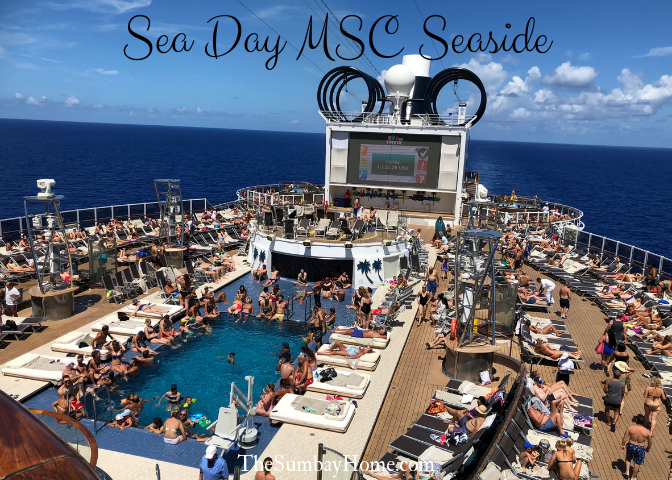 I mentioned before that we had some concerns about cruising on MSC (because we didn’t know much about them), but we had a great time. We usually cruise on Royal Caribbean and Norwegian, and this ship was comparable in many ways. There were some minimal differences that I will discuss further in this post, but overall the ship was great. 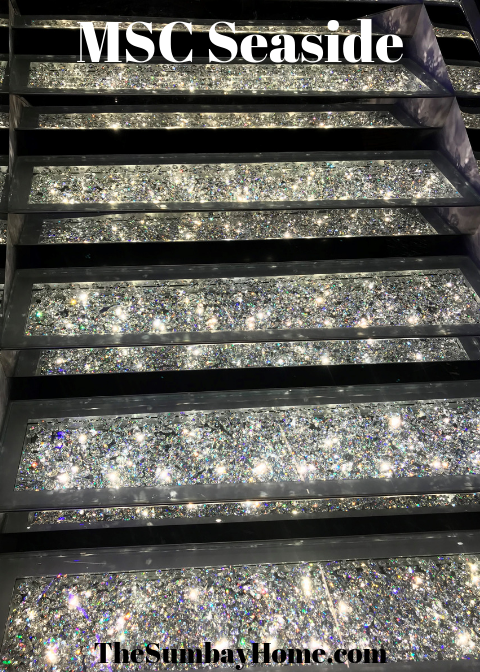 The ship also had 2 walkways with glass floors for you to walk over. One was on deck 18 and went over the South Beach Pool on deck 7. The other was on deck 8 and went out over the water on the sides of the ship. They were neat but a lot of people were scared to walk over them, but don’t worry you can go around them if you prefer. There was always live music in the center of the ship, I believe they called this area the Atrium. If you want to stay in shape while on board they have a very nice gym and even a basketball court. Did I mention they also have an F1 simulator (Formula-1 race car) onboard? Like I said, too much to list, but you won’t get bored. 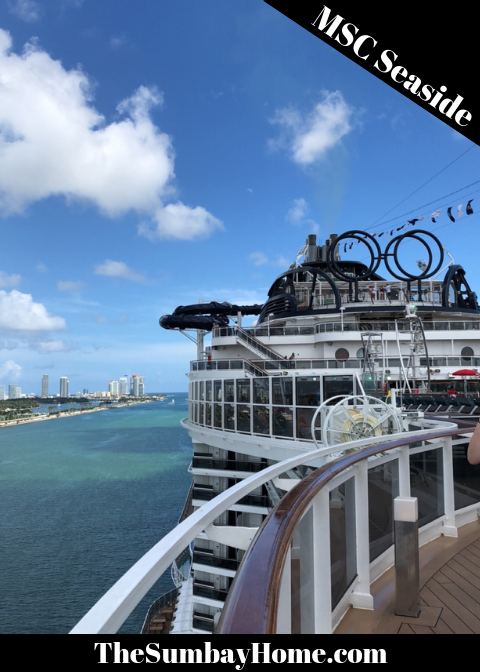 The staff and service onboard the MSC Seaside were impeccable. 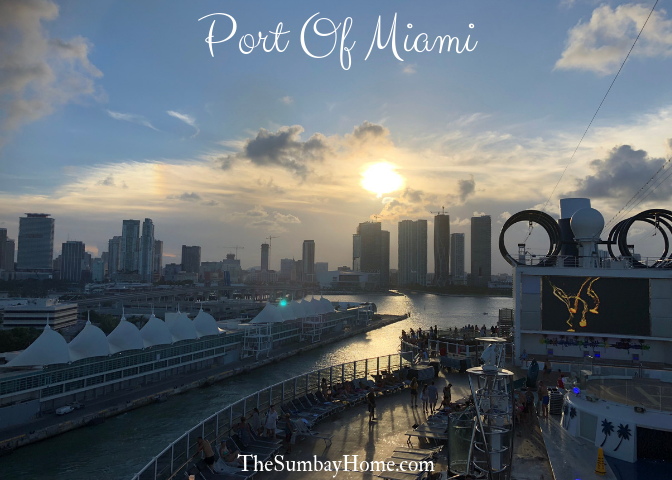 There were times where I felt like they were a little understaffed, compared to the other cruise lines we are used to. But the staff onboard was so good that they made up for it. We felt like they all paid attention to the little things. You could not walk past someone without them smiling and saying hello. There were staff members that remembered our names and what we liked after only serving us one time, that was impressive. If you need or want something, don’t hesitate to ask. 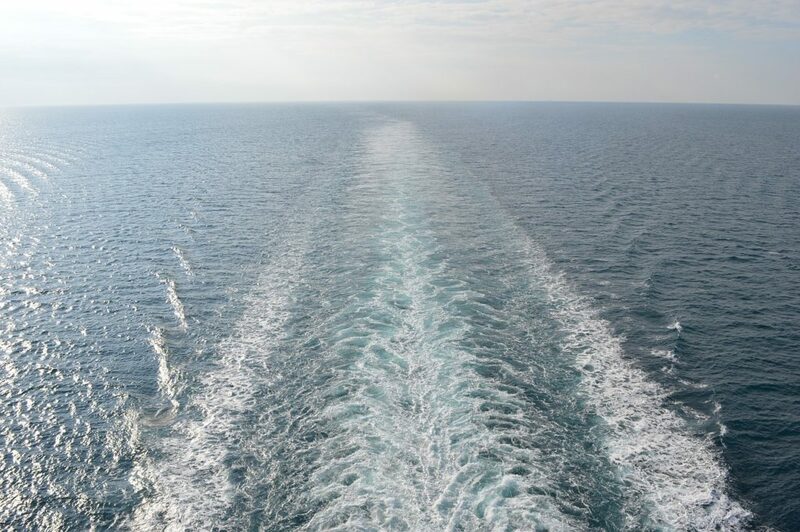 I am so used to hearing, “I’m sorry, but we can’t do that” on other cruise lines. However, anything reasonable that we asked for they would accommodate. Simply if they could, they would. I am talking about little things here like moving chairs or bringing something to your stateroom. Whenever we asked for something they made it feel like it was their top priority. The staff would remember these things and follow up with you to ensure you were satisfied. On the first day, we asked for a large ice bucket in our room at all times, and that’s exactly what we received. Years ago, cruise ships were known for towel animals. You used to get one in your stateroom almost every night. Nowadays on a 7-day cruise, you might get one or two towel animals. Well by day 5 we had not received any. So before going to dinner, we left a note for our room steward asking for one. 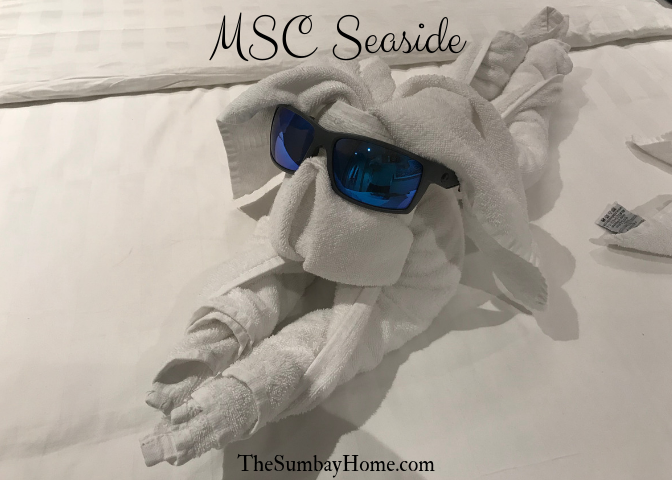 We came back to 3 towel animals in the room that night, and a new one each time we left the room for the remainder of the cruise. Just keep in mind that if you are not getting something you want, just ask and they will take care of it. You have to remember that the staff on cruise ships work for 6 to 8 months at a time without a single day off. And they work very hard each day to ensure you have a great vacation. If you are not sure how to reward them, check out our Guide to Tipping on a Cruise Ship. If they forget to do something, or you want something special, simply ask them and they will be sure to take care of it. After being on so many cruises it’s hard for any cruise line to impress me with the food. Regardless of the ship or line, there’s plenty of good and not so good food onboard. My suggestion is to explore everything and go back to eat at the places that you loved. One thing MSC had going for them, Pizza! Hands down the best pizza I’ve ever had on a cruise ship. I feel like the pizza most cruise lines feed you are on the same level as a $3 frozen pizza, but not MSC. One thing to note is that the margarita is their regular cheese, and they also have a cheeseless margarita if you want something a little lighter. They also have gelato, crepes, and very good specialty coffee like espresso and latte’s onboard. 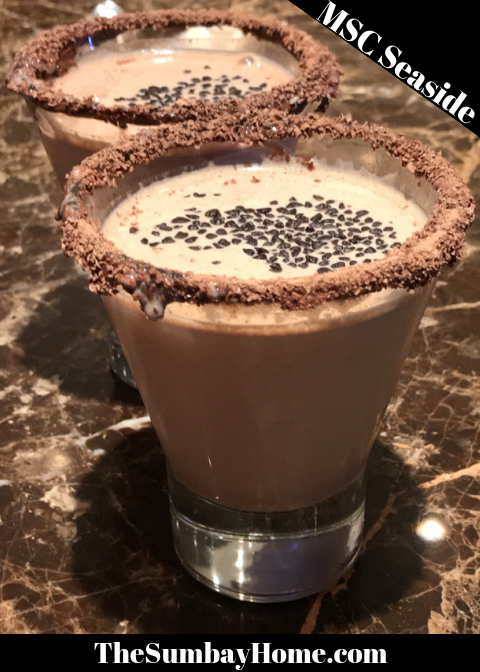 Check out the chocolate factory for freshly made chocolate and specialty cocktails made using their very own chocolate. This ship has two buffets onboard. A small one on deck 16 near the pool, for your convenience. And a large one on deck 8 at the back of the ship. So if you are at the pool and you don’t want to go very far, they have you covered. Otherwise, go to the one on deck 8 if you want more options to choose from. Breakfast at the buffet was ok. They usually only had one omelet station open with 30 people in line, one day I saw they had two. On most other cruise lines, there’s usually always 10+ people waiting in each station, but they usually have at least 3 or 4 stations open. This is one of the areas I thought they could use some extra help. However, to offset that line they did have over easy and medium eggs on the buffet line that you could get without waiting. I’m happy as long as I have fresh eggs, toast, and coffee for breakfast. Everything else I tried was good as well. The waffles, french toast, oatmeal, fresh fruits, and they even had 2 different breakfast pizzas (a sweet one / and one with eggs and bacon, but I didn’t get a chance to try these). We ate most of our lunches at the bigger buffet on deck 8. Overall, I was pleased with every meal. They always had plenty of different options to satisfy whatever you were craving. The basics like burgers and beef hotdogs, different sandwiches, pizza, grilled chicken, and vegetables were available each day. They also had plenty of other different varieties of food each day. One day we had lasagna, roasted chicken (this was amazing), shrimp scampi, shredded chicken tacos, and much more. We only went to the buffet for dinner a few nights, but again were very pleased with the food there. They had plenty of variety to choose from. There was a carving station with different sorts of meat each night. Remember this is an Italian cruise line, so be sure to try their deserts. Oh, and did I mention Pizza! The main buffet is open almost 24/7. It’s the definite go-to place if you are looking for food, but don’t know where to go. They keep the late night buffet options fairly simple. You can find sandwiches, pizza, and a small variety of different foods each night. In addition, they also have desserts, cookies, and the fresh fruit for you to choose from. We went to the main dining room for breakfast and lunch one time each. Both times were great, the food was similar to the buffet, but fresher and served to you by the waiters. If you want an omelet, you just order it and get it without having to wait in the long buffet line. The coffee also tasted much better in the dining room for some reason. For breakfast and lunch, most people just go to the buffet to try to get in and out. But don’t be afraid to give the dining room a shot, you might be pleasantly surprised. Yes, it will take a little bit longer than going to the buffet. They know this is not dinner and won’t try to keep you there for two hours. It will be a more relaxing experience with better food and service. Overall you might spend an extra 10 min going to the dining room over the buffet. The only thing is I don’t think they have pizza in the main dining room. If that’s what you plan on eating, stick to the buffet for that meal. I believe we went to the main dining room for dinner 4 out of the 7 nights we were on the ship. Overall, the food was good, but the portions were small. When you are on a cruise ship, the food is included. So if you are at dinner and everything looks good, and you feel you can eat it, you can just order it. Or you can get 3 appetizers and 2 entries if you would like, the choice is yours. Most people are amazed by this on their first cruise because we don’t typically order multiple dinners when we are home. Most cruise lines give you so much food at dinner that you really don’t need to order any extra food. They start off with artisan bread, then soup, salad, entree, dessert. Halfway through you are thinking what do they expect me to do with all of this food? 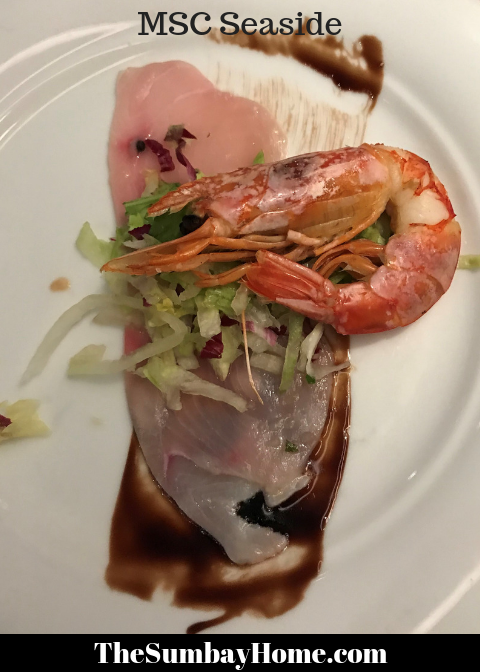 On MSC Seaside we found the dinner portions to be smaller than usual. However, we tried not to eat as much bread as we usually do (1 piece max). Where we used to fill ourselves on bread because we would be so hungry. The appetizers and dinner were simply not enough food. So we found ourselves ordering at the very least a salad and a few extra appetizers for the table. Don’s be ashamed, just try not to order more than you can eat. The first night I did not order much and had to order more food after I finished my dinner. But that’s ok, and if you didn’t like something, just order something else. They will take care of you, they just need to know what you need. This is my one complaint about the main dining room. Typically cruise lines have a classic menu with standard meals that are available each night of the cruise. These are good basic meals that you can get if tonight’s menu does not speak to your liking. Well MSC had a classic dinner menu, but the one night I wanted it, it was not available. It was on the night with the elegant menu, and that night the only poultry dish available was duck. When I tried to order the chicken from the classic menu they told me that since it was the elegant night they only offered that menu for the evening. Typically on a cruise ships main dining room menu, you can find a different chicken, steak, fish, pasta, and a vegetarian meal each night. But a different offering of these types of meals from day to day. Then they also have the classics menu with simple meals that you can order if you don’t prefer the feature meals for that night. My only complaint is if you are only going to have one poultry offering for the evening, it should be chicken, not duck. The waiters and head waiters were great. Very attentive and wanted to make sure everything was exceptional. I did feel that they were a little understaffed compared to other cruise lines. However, they worked even harder to make up for this. Usually, you have a head waiter, waiter, and an assistant waiter, in addition to someone getting drinks. I think the assistant waiter was the one getting drinks, so the waiter was the one doing most of the work on his own. 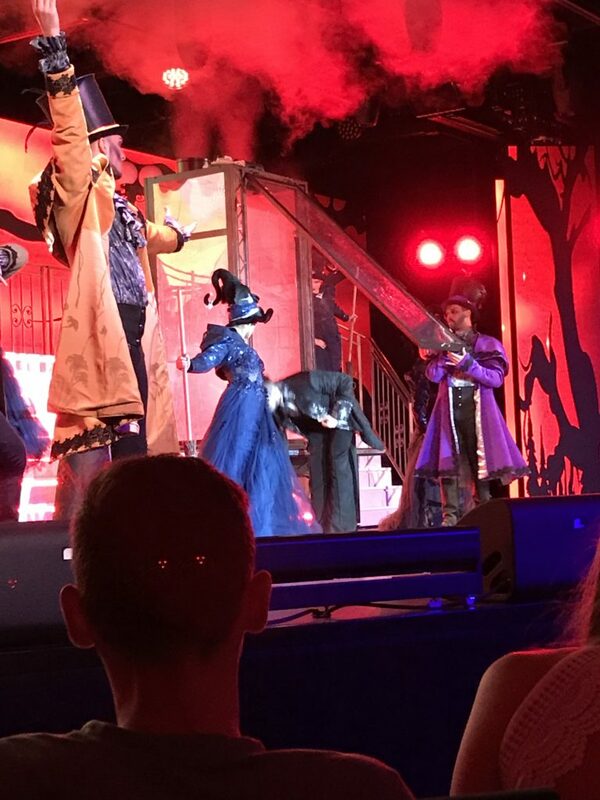 The shows onboard were great and very entertaining. What I liked most about it was that all the shows were around 45 min long and didn’t take up most of your evening. I suggest booking them early from your stateroom tv and showing up a little early to be able to sit where you would like. They do fill up quickly. The comedy show onboard was not as entertaining as we hoped it would be. We are not really into improv, but they did have a few good skits. 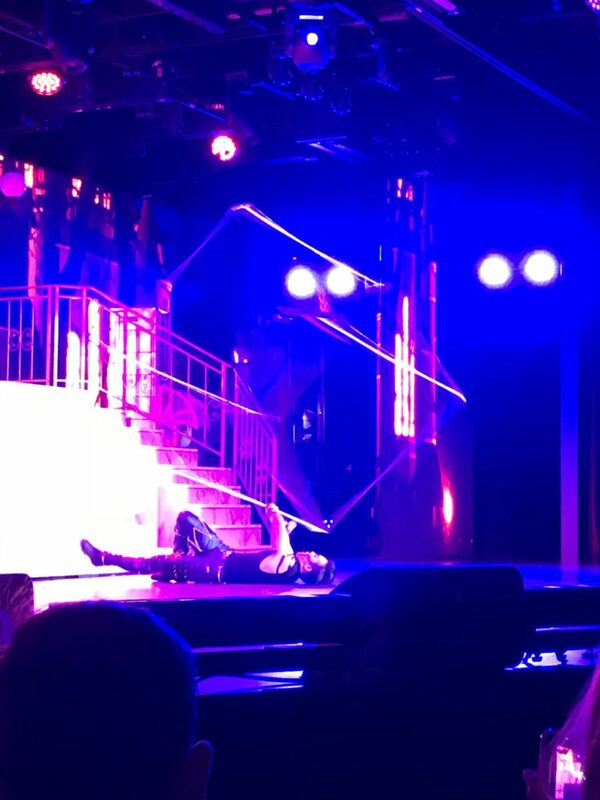 The entertainers and shows are constantly changing on cruise ships. I’m sure you will enjoy at least most of the entertainment on any major cruise line. We decided to give MSC a chance because of their prices. They had some pretty good deals and we’re glad we had the chance to check them out. We got a balcony stateroom for the price of an interior room on many other cruise lines. In addition, they also had a “Drinks on us” promotion that we received with our booking. The drinks on us package included bottled water, sodas, and basic cocktails for free during our cruise. We also had the option to upgrade the “Drinks on us” package to a Premium All-Inclusive Beverage Package for about half the price. Click Here to see what MSC currently has to offer. Hope you enjoyed the read, and let us know if there’s anything holding you back from giving MSC a chance. Or let us know if you have any questions that we might not have answered. 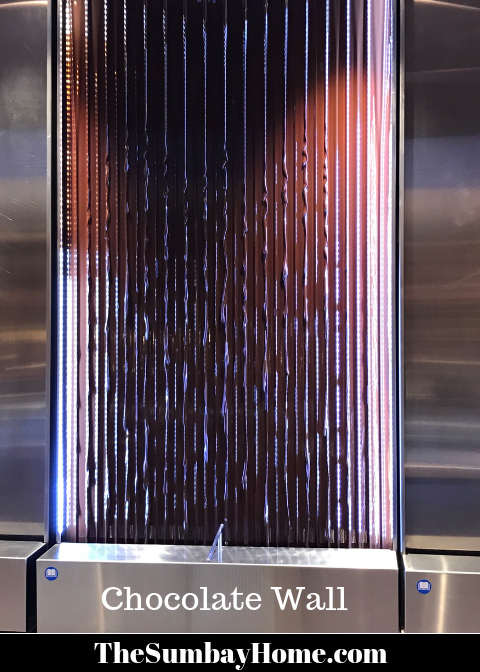 MSC Seaside – What’s it like onboard an MSC Cruise for seven days? Chick here to find out what you can expect onboard, and see if you should book MSC for your next cruise vacation.